Often overlooked, food preparation areas are another important location where water treatment is critical. Lead and other contaminants can be cooked into food in surprisingly high quantities and need to be effectively removed. Lead contaminations – Lead both dissolves and particulates flake off piping and connectors when present in the water distribution system. Lead also accumulates in the bio film inside all piping that acts like a reservoir, dislodging with common changes in water chemistry, system upsets, pressure drops and high velocity flushing. Water mains and lead service lines – Lead water main connectors and service lines from the street to the building were often made of lead before 1960. Interestingly, their replacement exacerbates the problem by freeing particulates that further accumulate in the piping downstream and give off high levels of lead for years. Plumbing and fixtures – Buildings constructed before 1987 used lead solder joints, which can be a major contributor of lead contamination. High content lead faucets and fountain bubblers, even the “Lead-free” products installed before 2014, can be a problem and should be replaced. Their replacement will not, however, solve the other upstream problems. Other contaminants and copper – The EPA adds to the laundry list of restricted contaminants on a regular basis. Chemicals like volatile organic compounds (VOCs), residual pharmaceuticals and even endotoxins are increasingly recognized as health risks. 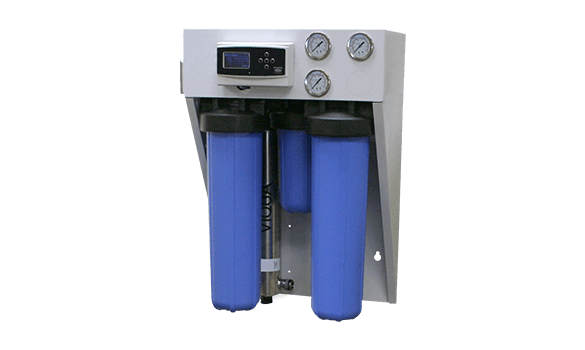 In addition, the water distribution infrastructure is a living system, susceptible to regular system upsets, ground water incursion and bacterial growth that can occur in an instant. Since you can’t typically see, smell or taste most of these contaminants, a final barrier water treatment system is the only sure way to protect children and provide your District with piece of mind. For more information, contact Kelly Weyandt, Marketing Manager at Kelly.Weyandt@ecowater.com or (651) 731-7051. NSF 53 – Tested and verified by independent laboratory testing for 99.3% lead (both colloidal and dissolved lead) and VOC removal. NSF P231 – Tested and verified by independent laboratory testing for 99.9% bacteria and cysts removal. safe water regardless of municipal system upsets, water main breaks or plumbing problems. number of gallons is reached. industrial design also ensures problem-free operation for years to come. along with rental options to suit any budget. The Safe Fountain System uses two patented technologies, MetSorb®, a unique absorber that captures lead, and FACT® particulate filters to remove fine particles and prevent system fouling. Often overlooked, food preparation areas are another important location where water purification is critical. Lead and other contaminants can be cooked into food in surprisingly high concentrations and need to be removed effectively. 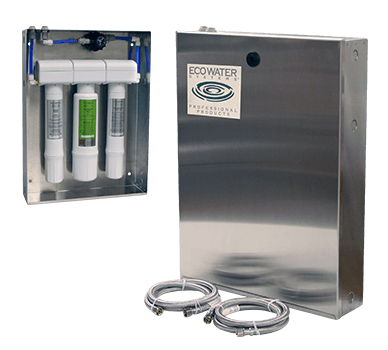 EcoWater offers unique solutions for food prep areas that combine kitchen re-plumbing with proprietary water purification technology. First, our professional plumbers install all new kitchen piping, using PEX flexible tubing, guaranteed not to leach contaminants. We also replace all kitchen faucets and connectors with lead-free components and hook up all faucets, pot-filters, steamers, ice and coffee makers to our Safe Kitchen System.